Gwilym Rees-JonesEvery year Bangor University’s Alumni Advisory Board considers candidates and advises the University on an Alumnus of the Year award. Bangor University was proud to present Gwilym Rees-Jones with 2018’s Alumnus of the Year award during graduation week. Gwilym graduated from Bangor with a degree in Maths in 1963, which was followed by a Diploma in Teacher Training in 1966. During his final year at Bangor, 1965-1966, Gwilym served as Bangor’s Students’ Union President. His proudest achievement was presenting a report proposing a bespoke Students’ Union building and facilities to the University Grants Committee, which resulted in warm praise from the then Vice-Chancellor, Charles Evans, and the proposals being accepted. This building served the University well until it was very recently replaced by Pontio. The Alumnus of the Year award recognises the achievements, both professional and personal, of our graduates; especially highlighting those who have chosen to remain engaged with their alma mater and give back, either through service, philanthropy, or, in Gwilym’s case, both, to the University. After leaving Bangor, Gwilym Joined British European Airways as an Operational Research Officer and rose to become Director of Operations Planning in, what then became, British Airways. Gwilym states that the period leading up to the eventual privatisation of BA in 1987 and beyond into the 90s was the most exhilarating and exciting of his whole career. Employees became shareholders, the airline was profitable, and gained an enviable reputation for innovation and customer service. His ‘big break’ came in 1987 when he was appointed General Manager of the Property department. Gwilym says that it was during this time that he experienced his proudest achievement at BA. This was winning planning permission for the new HQ, convincing the main Board to approve £200m (in 1990 money) for its construction, and the restoration of landfill sites to create a 250 acre public park for the local community. In 1994 he was appointed as Project Director for Terminal 5 at Heathrow. The Terminal 5 Planning Inquiry lasted 4 years, the longest in planning history, but, under Gwilym’s watch, was eventually granted. In 1998 he was appointed Director of Operations Planning, reporting to a member of the Main Board. This department was the heart of all medium and short term planning for the airline, including airport facilities, airport IT systems, the passenger timetable and airport slots, manpower planning for aircrew and their work rosters, the Terminal 5 project, and the rest of the Property department. After a hugely successful career, Gwilym retired in 2002. 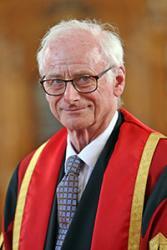 Although he graduated from Bangor over 50 years ago, Gwilym has remained engaged with the University. He has provided support to current students through careers sessions on Management Skills and is a loyal and generous alumnus, having supported The Bangor Fund regularly for a number of years. Gwilym’s wife Janice, attended the ceremony to see him receive his award which was presented with a citation by Professor Paul Spencer.